FORT MEADE, Md. 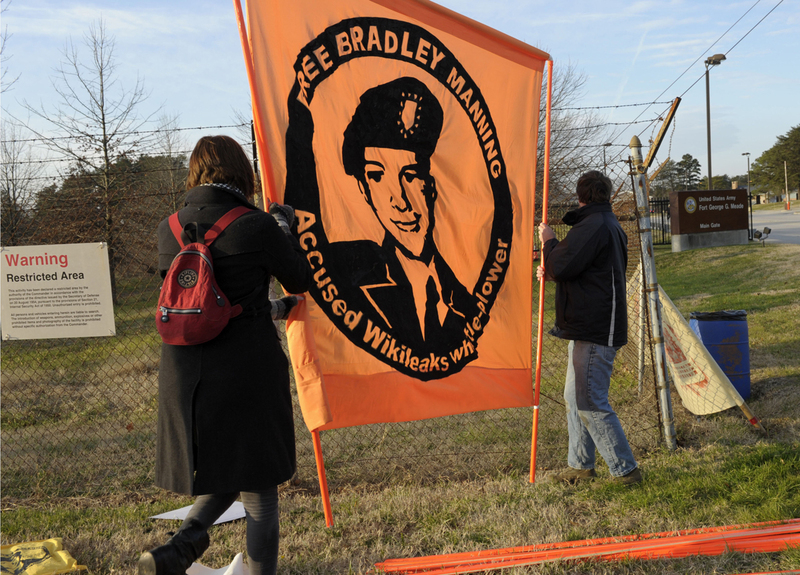 - The civilian attorney for Bradley Manning, the Army private accused of leaking classified information to the WikiLeaks website, has asked the presiding officer at his pretrial hearing to step down. The presiding officer, Army Lt. Col. Paul Almanza, called a recess 30 minutes into Friday's proceeding at Fort Meade in Maryland to consider the request. Manning defense lawyer David Coombs cited four reasons Almanza, who is an Army reservist, should recuse himself. Chief among them is Almanza's civilian occupation as a Justice Department prosecutor. The Justice Department is conducting a criminal investigation targeting WikiLeaks founder Julian Assange. Manning is charged with aiding the enemy by leaking hundreds of thousands of secret documents to the website. Almanza said he hasn't formed an opinion about Manning's guilt or innocence. Coombs also argued that Almanza had wrongly denied a defense request to call as witnesses the "original classification authorities" who first decided to classify as secret the material WikiLeaks published. "Let's put witnesses on the stand," he said. "Why is this stuff classified? Why is it going to cause harm?" Today's pretrial hearing, the rough equivalent of a civilian grand jury proceeding, is to determine whether Manning will be court-martialed on charges that he stole an enormous trove of government secrets and caused them to be made public on the Internet. Manning, dressed in his Army camouflage fatigues, made his first public appearance in a heavily secured courtroom Friday. He is suspected of giving the documents to WikiLeaks, the anti-secrecy website that last year began publishing the materials on its own and in conjunction with news organizations in the U.S. and Europe. Manning's lawyer asserts that the documents' release did little actual harm. If his case goes to trial and he is convicted, Manning could face life in prison. The government has said it would not seek the death penalty. Manning, who turns 24 on Saturday, was detained in Iraq in May 2010 and moved to a Marine Corps brig at Quantico, Virginia, in July. Nine months later, the Army sent him to the military prison at Fort Leavenworth, Kansas, after a series of claims by Manning of unlawful pretrial punishment. During the hearing's opening moments, Manning responded to a series of questions from Almanza. After summarizing the charges against Manning, Almanza asked if he understood the charges. "Yes, sir," Manning replied. Asked whether he had any questions about the charges, Manning replied, "No, sir." Dressed in his camouflage Army fatigues and wearing dark-rimmed eyeglasses, Manning sat at the defense table showing little expression. He occasionally twirled a pen between his thumb and finger. The hearing is open to the public, but with limited seating in the courtroom. A small number of reporters were present but not allowed to record or photograph the proceedings. Manning was not seen arriving in the courtroom because he was brought in before members of the news media were allowed to enter. The case has spawned an international movement in support of Manning, seen by anti-war activists as a hero who helped expose American mistakes in Iraq and Afghanistan. To others he is a traitor who betrayed his oath of loyalty by deliberately spilling his government's secrets. WikiLeaks suspect Manning a hero or a traitor? A U.S. military legal expert told reporters shortly before the proceedings began that the presiding officer is likely to make his recommendation on whether to court-martial Manning within eight days after the hearing ends. The hearing is expected to last over the weekend and possibly well into next week. The legal expert, who could not be identified under Army ground rules, said Manning is to be present for all proceedings, including sessions closed to the public for consideration of classified material. Manning, 23, was at the defense table Monday morning along with his civilian lawyer, David Coombs, and two other Army lawyers. Meanwhile, Manning's supporters planned to maintain a vigil during the hearing and were organizing a rally for Saturday. The officer who presides at the hearing will eventually recommend to Army Maj. Gen. Michael S. Linnington, commander of the Military District of Washington, whether Manning should be court-martialed. Linnington could choose other courses, including applying an administrative punishment or dismissing some or all of the 22 counts against Manning. Last month, 54 members of the European Parliament signed a letter to the U.S. government raising concerns about Manning's 18-month pretrial confinement.